It's a match between the legends of Liverpool FC players (mostly former Liverpool Players who still can kick the ball), picked and choosen by Steven Gerrard and Jamie Carragher. It's also a charity match so all fund raised will proceed to Alder Hey Children's Charity. 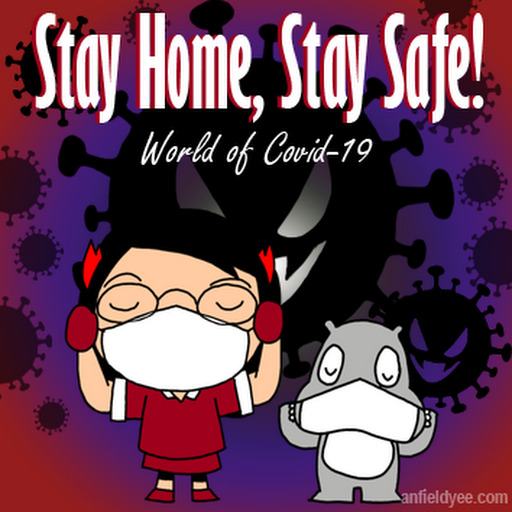 I feel like shaking anyone who's around me! 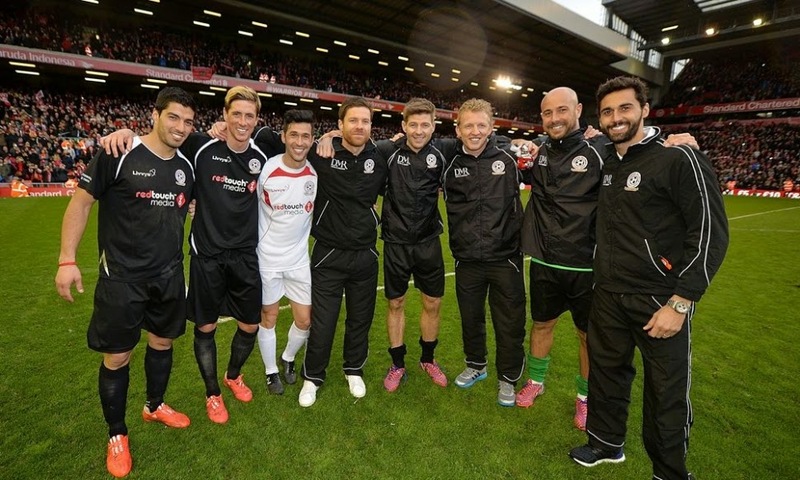 Those players whom I adore during my teen years will be playing at this charity match!! Can't believe after so many years I have the privilege to actually see them get to play again at Anfield, although the only channel I could catch up the updates is from Liverpool's official social medias and it's not even the full game lol. 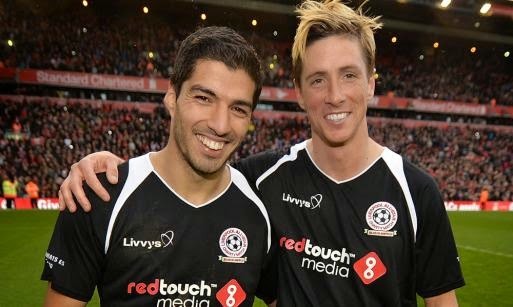 The highlights was probably Torres and Suarez, the pair which so close, yet so far to have both of them play together. I always wonder what would happen to Liverpool if we have the both of them. Suarez alone had already helped us to fire up to the top of Premier League table. What would it be like if we have Torres team up with him? Perhaps this partnership were never meant to happen, for a good reason. Heard that Torres dyed his hair for this special occasion. Awww Torres I forgive you now lol! Another thing that makes this match so special is to witness some players, whom once a fierce rival and now become a good friends! This is something you cannot get elsewhere, the beauty of football. 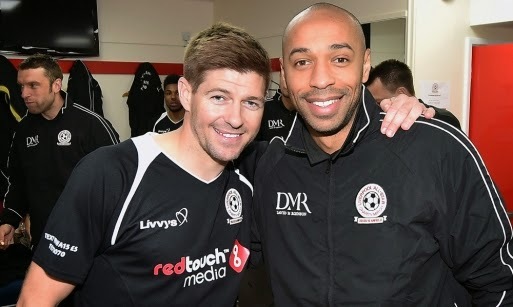 Probably the only non-Liverpool football player I look up to is Thierry Henry. What a classy and respectful footballer he is! This is my most favourite photo. AHHHHHHHHHH those were the days! Should have included Carragher and Riise here but I guess both of them are either too camera shy person or too busy wandering around. 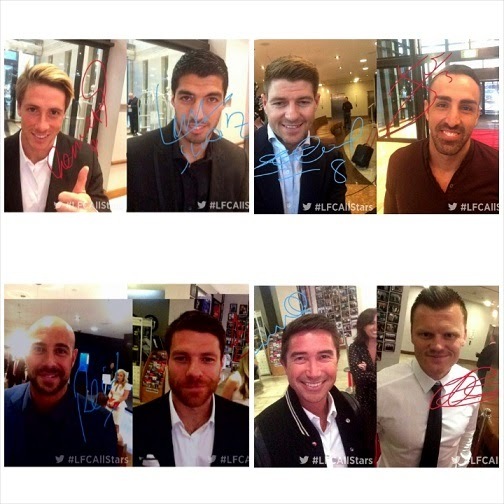 Saw this picture only realize that Harry Kewell was there, too. Look at all my lengzais here!! Actually we once had the BEST team after all! When we are frustrated, we tend to lose sight on things we should appreciate and thankful for. Admittedly, the trophy that I wish (and hope) the LFC to win is the BPL trophy. If this squad can win for us the Champions League, why not BPL? Despite going through so many seasons of BPL and yet not having this trophy bagged in, those where the dissatisfaction feeling kicks in. I started to compare this team with MU and Chelsea. I used to envy how awesome squad those two teams had, and started to feel worried (and frustrated) that we do not have such a strong squad team to face all kinds of challenge. As the time passes by, all these legends had left us one by one, there's when I realize the Liverpool team I used to support is actually very strong! I started to feel ashame for myself comparing them to other team. We should give them 100% support, no matter what kinds of circumstances, right? Right? Why am I comparing? What am I complaining? I do miss this dream team, so much. How nice if we could have all of them play for us again? (I would really REALLY looking forward to see the Suarez-Nando combo!) But I know it's impossible. Everything must come to the end. No matter how much we harping about the past, we have to move on. But one thing I'm very, very sure is whenever I reminisce the times where I used to watch them play on the field, it brings me to smile: those silly moments where I'd my sleepless nights just to catch their game, the arguments between who-is-gonna-get-that-TV with my family, the player's never said die spirit so they could win more trophies for the fans and etc. It's the memories I truly enjoy. I just want to say THANK YOU, for the memories you've give to us, for the fans, and the club. 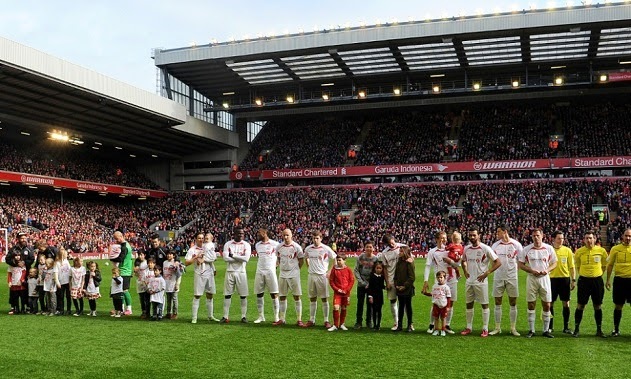 Each of you definitely has a special place at Liverpool! Thanks for the memories and good bye.. The current squad may not as glamour as what it used to be. As much as how I miss the old squad, it's the club (to me, it's the fans) we are supporting. As year goes by, I find myself no longer after the glory of the club anymore. Sure, we all hope the person/ club we support wins more trophies, but it's the feeling of supporting this football club is what I truly enjoy the most. After all, God has a greater plan for Liverpool FC. Greater things are yet to come!!! But I hope I won't have to wait that long lol.